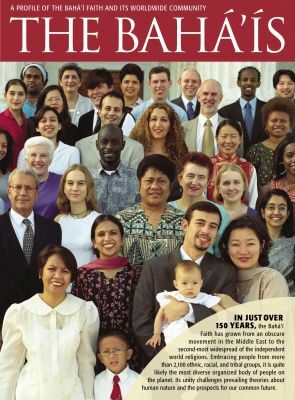 Cover of "The Baha'is Magazine"
Baha’u’llah, the latest of these Messengers, brought new spiritual and social teachings for our time. His essential message is of unity. He taught the oneness of God, the oneness of the human family, and the oneness of religion. Baha’u’llah said, “The earth is but one country and mankind its citizens,” and that, as foretold in all the sacred scriptures of the past, now is the time for humanity to live in unity. Founded more than a century and a half ago, the Baha’i Faith has spread around the globe. Members of the Baha’i­ Faith live in more than 100,000 localities and come from nearly every nation, ethnic group, culture, profession, and social or economic background. Baha’is believe the crucial need facing humanity is to find a unifying vision of the nature and purpose of life and of the future of society. Such a vision unfolds in the writings of Baha’u’llah. You are a member of a single human family that includes every race, religion, nation and gender. There is no room for prejudice in your heart. God loves all of us, regardless of the time or place we live. That’s why there have been many different Messengers from God throughout history. Each one taught humanity what we needed to know at that time, and prepared us to learn more. We call it Progressive Revelation. You are responsible for your own spiritual growth. Through prayer and with trust in God’s assistance, you use your mind and heart to investigate reality, search for truth and deepen faith. And living and acting in harmony with reality, truth and faith expand and solidify that growth. Women and men are equal. When we truly understand that our spiritual qualities are more important than our physical ones, both men and women will begin to value characteristics and activities which have traditionally been considered feminine. You are essentially good, but you must use your free will to develop your God-given potential. Education both material and spiritual is the key to becoming the best possible person. World peace is possible, but it must be founded on justice and supported by an international federation that is dedicated to promoting unity while preserving diversity. Your head and your heart don’t have to be in conflict. Science and religion, faith and reason are just different ways of looking at God’s creation. If they seem to be in conflict, it is time to look deeper. You are a spiritual being, who is being trained through material experiences, and when your life is over, you will continue to learn and progress through spiritual experiences. The human race is maturing. God’s Kingdom on Earth will not drop out of the sky… it will be built by all of us, one heart at a time.